In the ancient civilizations of the Near East there were strange stories about the place of chaos in the beginning of all things – and the chaos is specifically located in water. It seems odd to me that people who largely lived in arid countries should imagine the world beginning as a watery chaos – but that is certainly what they did. The Egyptians imagined the world’s beginning as a watery chaos (the god, Nun). It is from this watery thing that the god, Atum, generates himself and then creates the other gods. The Babylonian creation story, the Enuma Elish, said that before there were any other gods, and before the heaven and earth were set in place, there were only Apsu (the freshwater ocean) and Tiamat (the saltwater ocean). 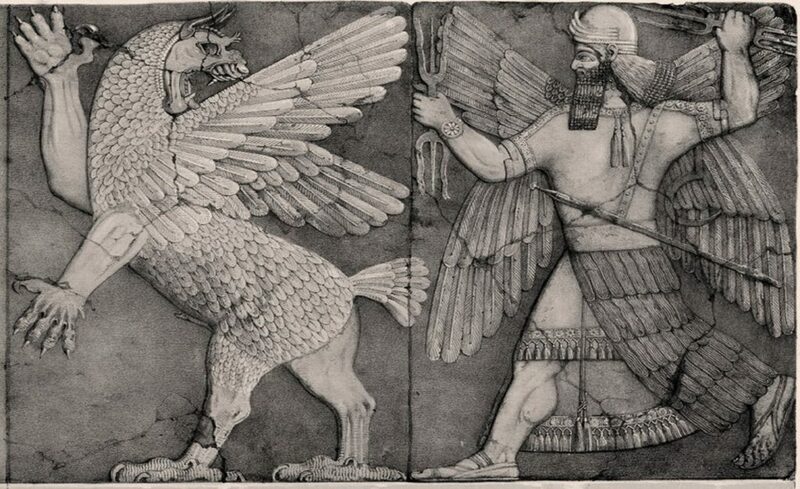 The god Marduk slayed Tiamat (who was also a chaos creature) and from her created the heavens and the earth. All of this, of course, seems quite foreign to the faith of Abraham, Isaac and Jacob. It is a sample, however, of the cultures in the midst of which their faith was revealed. It also provides a backdrop that shows how unique and striking the creation story in Genesis truly is. Hidden from our modern eyes but visible in the Hebrew is the “Tiamat” monster. It is within the word for “without form” (tohu) and “deep” (tehom). But in our Hebrew account, there is no slaying of a monster, no polytheistic struggle. Rather, there is God (Elohim) who simply speaks, and accomplishes the creation. There is a watery chaos, now raised up into a theological account of extreme sophistication. It is a repudiation of the surrounding culture-myths – but it is still rendered in a language that knows that culture. In St. John’s gospel, there is something similar. He opens with reference to the Logos, a concept completely familiar to earlier Greek philosophy. But where philosophy sees an abstraction, St. John proclaims the particular: this Logos “became flesh and dwelt among us.” He takes the language and ideas of a surrounding culture and transforms them into the stuff of true revelation. In many ways, this is very much a part of the Incarnation. Every year around Christmas time, we begin to hear noises about Christmas trees having “pagan origins.” And there are many who rush to the defense of the poor trees. I yawn. My ancestors worshipped trees, and I daresay their later Christian descendants were glad to see the Church baptizing the trees as well as people. There simply is no “pristine” matter from which the faith starts fresh. God always speaks and reveals Himself in terms that can be assimilated. He does not destroy culture, but fulfills it. The Christmas tree is a stark reminder that the Child born on that day has a rendezvous with a Tree, and that there is no getting around it. There is a Tree at the heart of our faith, even as there was at the heart of the Garden. CS Lewis once opined that pagan mythology consisted of “good dreams sent by God to prepare for the coming of Christ.” Such myths can also carry deep darkness and confusion – but such is the nature of a world that is broken. God does not offer us redemption by destroying a broken world. He does not erase or eradicate the cultures of mankind. It is only a darkened theology that imagines every production of the human imagination to be worthy only of the dung heap. That sort of destructive view belongs to the scions of Calvin and the iconoclasm of Wahabis: it is not the work of God. O LORD God of hosts, Who is mighty like You, O LORD? Awake, awake, put on strength, O arm of the LORD! Awake as in the ancient days, In the generations of old. Are You not the arm that cut Rahab apart, And wounded the serpent? That made the depths of the sea a road For the redeemed to cross over? Reading along without a commentary, it would be easy to assume that Rahab is a country or a ruler. However, it is the name of an ancient chaos sea-monster. But in the Psalms and Isaiah, this pagan sea-monster is vanquished and subdued by the God of Israel. It is not meant as a literal account. The imagery has been taken up to express God’s dominion over all things and His victory over chaos. Israel, brought into the Promised Land, is God’s ordering of the world, a restoration of “Eden,” in a manner of speaking (Ez. 36:35). All of this imagery is taken up in the Christian faith in the Church’s meditations on the Baptism of Christ. The Western tradition (Catholic and Protestant) has long neglected this feast, only giving it attention in the past 50 years or so. In the East, the Baptism of Christ (Theophany) follows Christmas by 12 days, the same day that the West honors the visit of the Magi. A major reason for the West’s neglect of this feast, I suspect, is its strangeness to the later atonement theories that became popular. Jesus has no sin to be washed away; He is guilty of nothing. His Baptism thus stands as a contradiction to later Western accounts of the sacrament. Because of the tender compassion of Your mercy, O Master, You could not endure to behold mankind oppressed by the Devil; but You came and saved us. We confess Your grace. We proclaim Your mercy. We do not conceal Your gracious acts. You have delivered the generation of our mortal nature. By Your birth You sanctified a Virgin’s womb. All creation magnifies You, for You have revealed Yourself. For You, O our God, have revealed Yourself upon the earth, and have dwelled among men. You hallowed the streams of Jordan, sending down upon them from heaven Your Holy Spirit, and crushed the heads of the demons [“dragons” in some translations] who lurked there. You crushed the heads of the dragons in the waters. and gave him to be food to the people inhabiting the wilderness. For those who are unfamiliar with Pascha and Baptism in an “Eastern key,” this language can seem quite odd. It is the dominant image of salvation within the Eastern Church. The great hymn of Pascha, repeated seemingly hundreds of times in that season, is, “Christ is risen from the dead, trampling down death by death.” It is not a hymn of payment, or punishment, but of going into the strongman’s kingdom, binding him and setting free those who are held captive. The heads of the dragons are crushed, the heads of leviathan are broken in pieces, Rahab has been cut apart. I have seen false comparisons between East and West, where the West is credited with an emphasis on the Cross and the East with an ephasis on the Resurrection. It is a comparison that only a Westerner would make. Within the East, the Cross and the Resurrection are not separated – they are a single action devastating the adversary, leading captivity captive and setting all of the captives free. This is the Lord’s Passover. I took a class in Seminary taught by one of the foremost Hebrew Scholars of today. It was entitled “The Bible Among the Myths” (Dr John Oswalt). He taught much of what you are writing today showing the marked differences between the narrative of the Scriptures and the Pagan Creation Myths (BTW Leviathan is the Canaanite version of Tiamut and Baal is the hero). I concur with your emphasis on the importance of the Baptism of the Lord as not only a foreshadowing of His descent into Hades but also as a counter point to pagan beliefs. I had not though of why the West ignores Theophany, but your reasoning is sound. Baptism is either degraded into a mere symbolic act or ignored altogether. I know a man who constantly preaches that Baptism is unnecessary for salvation as well as communion. Now I can see the connection with the heretical doctrines of atonement and this position. Yes, my former Willow Creek associated Evangelical Church stopped requiring baptism or even membership for partaking of communion several years ago. If baptism and communion are not necessary in any sense for “salvation”, and for effectively communicating something of the nature of saving faith, why bother at all? It was when the pastor started prefacing the serving of communion with the disclaimer “this is not magical; it is not mystical” making explicit the Zwinglian theology of that church, any shred of meaning for these rituals (as real connection with Christ in His Death and Resurrection) in that denomination evaporated for me. It would be many years before I found my way to Orthodoxy, but I can mark that period as the beginning of the end of my anabaptist beliefs. (Probably in all of us). This was very informative and educational, thank you. Father, your blog post here seems to complement Hart’s proclamation. However, from a book I just began skimming through today called, “The Spiritual World in the letters of Paul the Apostle,” by Guy Williams, states basically that these “bad angels” are from the spiritual world common to St Paul’s presiding culture, both Jewish and pagan. The author presents the spiritual world of Paul’s day and age as one of possession; good spirits possess people (apparently sent by God, and not always distinguished from His own Spirit) just as well as the bad ones, and they run the whole show alongside and in intimate connection to what we would call the “material” world (the author is quick to point out that the dualist distinction between the spiritual world and material world do not exist in ancient minds as they do in modern ones. Rather there is a wholeness to it all). And this was the undisputed, common worldview among the people of his time. Much like the worship of trees was common to your ancestors. So my question is this: Is Paul using this terminology within his Epistles in order the “Baptize” these spiritual ideas, much like the Church Baptized the trees your ancestors worshiped? Is he shedding light on misguided and false beliefs in order to bring them to fullness and truth? If Hart is right about he true focus of Paul’s Epistles being “about the overthrow of bad angels,” then is this overthrow best understood as a Baptism of a misguided and false spiritual world common in his day? Is the belief in “bad angels” misguided? Or does Paul speak in his Epistles about possessive good spirits and possesive bad ones because that is the actual and very real nature of his and our world? Because when you read his Epistles he comes off as truly believing in the spiritual world he describes within them. He comes off as actually believing in the spiritual ideas common to his era, presenting them to his readers with a distinct knowledge and authority given to him as an Apostle of the “good tidings” (as DB Hart puts it in his translation) entrusted to him by Christ. In fact, Paul states that everything he does (and therefore writes), he actually does IN CHRIST, meaning it is no longer himself who acts, but Christ who ‘posseses’ him and acts (like a good Spirit, who is not always distinguished from other good spirits that, likewise, posssess people). Lastly, I will say, it seems Paul believes in the overthrow of Archons in a way that is different than the overthrow of tree-worship. Christ’s Spirit, as One who possesses people, is presented by Paul in a way that fits perfectly with the common beliefs of his time. I dare say, this same description of Christ’s Spirit wouldn’t have fit so neatly with the tree-gods of your ancestors as it does with the Archons. And, in all honesty, Paul comes off as slightly gnostic in his belief in Archons. No wonder gnosticism became so popular. It seems a natural outgrowth from the Archon-filled Epistles of Paul. I think the author you are citing (Williams) is incorrect. I do not think there is a confusion viz. spirits and Spirit. The “spirits” of the prophets, for example, is not about spirits inhabiting them, but about their “spirits,” which is often used interchangeably with “soul.” I’m not sure what the author’s agenda is – but this is off-base. I do not think St. Paul has in mind a particularly baptizing of cultures. Indeed, I would rather suggest that St. Paul’s world-view is not nearly so much a cultural artifact as it is a description of things as they are. He was familiar with a spiritual reality that transcended what we generally experience – that is to say – he knew what he was talking about. It’s a very complex set of understandings – which makes it so easy for pseudo-scholars to manipulate for various agendas rather than trying to articulate what is, in fact, the case (with St. Paul, etc.). But I would agree with Hart, that what most people (i.e. our present Western understanding) see when they read St. Paul is, in fact, not what’s there. The Eastern Fathers understood it very well – which is why you almost never hear them wasting time going on and on about “justification” and the like. They never read Luther and so, did not mess up St. Paul. A useful little book, considered a classic by some, by a Lutheran scholar (yes, I know), Gustav Aulen, is, I think a very useful read. The book is Christus Victor. It describes 4 great views of the atonement. It’s a bit too reductionist – but paints things in a very clear picture – which makes it useful. What he describes as the “classical” view of the atonement – is the defeat of the hostile powers – and all that is associated with it (sin, death). It is the language of Pascha, the language of St. Sophronius’ Baptismal prayers (that we use) and of St. Basil’s Eucharistic anaphora. It is the language of many, many early Eastern fathers – and it is the language of St. Paul and the rest of the NT. My “theological” journey to Orthodoxy began, in many ways, with that book, though I didn’t know it at the time. One should read it, and then work at forgetting everything else you’ve ever read on the topic of the atonement – just use that single understanding as the lens for reading the NT and you’ll see that it is, in fact, what the NT and the early fathers are saying. Gnosticism predates Christianity and tried to hijack the faith. Saint Paul used similar words because he was refuting them on their own turf. Irenaeus’ “Against Heresies” was written for the same reason and Saint Irenaeus uses similar language to attack their beliefs. Regarding all the “unnecessary” things… I am tempted to say that, really, the universe was “unnecessary,” but God in His exuberant creativity created all of it…all those unnecessary planets, stars, butterflies, flowers and even us. Then, in his fullness, He gave us the joy of all those “unnecessary” angels and saints, etc. Why would anyone want a “minimalist” God, or a minimalist salvation. Thanks be to God for the abundance of saint-friends, the joy of Baptism and Eucharist, candles that smell of bees, incense that smells of roses, and, last Saturday, the delight of blessed water cast on the faithful! How dull to want only the bare minimum of Life! I love the symmetry (?) this article provides. The 1st Century Jews of Jesus’ crowd believed the sea to be Hell — the place of the dead, of chaos, etc. Your article affirms this. And it is why the Text shows us stories of demon-infected pigs running off a cliff into the Sea. It is why Jesus appearing on the water is an horrifying ghost to the disciples. Thanks, Father Stephen, for additional background which renders the Scripture into vivid technicolor. Thank you so much for this. My journey with Orthodoxy has been bumping against this weird Protestant idea, the hunt for the ‘real’ original church. That means no icons as apparently they (as we understand and venerate them today) came in later centuries — though imagery has always been a part of the church. Where is the “pure” starting point? But (to say nothing of the Councils) why should Christ through the Church NOT redeem art as a tool for communion? I’ve felt this way about a lot of art that conservative Protestants reject, so it is a great relief to no longer feel like part of a strange minority. Thank you. As I read the lexicon for today this question came to mind. Does our Church in her services connect someway the Transfiguration with Theophany? At the Transfiguration we hear the voice of the Father and the Cloud (Shekina glory), instead of the dove, enveloping Christ and the two disciples. Seems a parallel in some ways. I couldn’t tell you what the author’s angle is. It’s literally just a book I happened to stumble upon on the internet that looked promising for what I’ve been searching for. But maybe not, maybe it’s a dud. One helpful tidbit I came across (though I can’t remember exactly where I found it, and wouldn’t know a way of discerning for myself if the author is correct in his statement or not anyways) was that in ancient Judaism ideas such as carnal man, man of flesh, and spiritual man are not dualistic and opposing distinctions, as we moderns often like to describe them, but a continuum of the human state. This idea reminded me of your reference to being, well-being, and eternal-being, though I’m not sure if its actually related. But anyways, I had read all of Romans (and 1 Cor, and Galatians) in DB Hart’s translation, and while trying to discern Paul’s meaning I was struck by Hart’s decision not to capitalize the word “spirit,” nor use the definite article “the” in front of spirit in much of the usual places that other translations do. This made me very curious. Were Protestant translations purposely capitalizing and using “the” in places where it is not actually warranted, possibly to fulfill their own agenda? I hope I didn’t go too far in my response. Part of the problem in reading Greek is its use of (or absence of) the definite article (where we use “the”). It’s not really the case that saying, “spirit” rather than “the Spirit” is a huge distinction – that is – that everytime you see the definite article it is the Holy Spirit, and everywhere it’s not is something else. Context is, indeed, important and inescapable. That is why the Tradition (in the East) is important, I think. I like especially reading in the early fathers (no later than Maximus, but mostly pre-Nicene) for context. The battle with the powers is exceedingly important and the author is correct that it is overlooked. The Reformation so colored St. Paul that few can read him well at all. I also suspect St. Paul is dependent on the Hebrew when he speaks of “flesh” and “spirit.” “Basar” is the Hebrew – it’s an interesting term in itself. Think of “all flesh shall see it together.” It can be a simple collective term for “all created beings on earth.” I tend to read it like a “principle,” i.e. human beings when considered in terms only of their creaturely existence without reference to God. Indeed, it could almost be translated as “secular man”. Hmmm. Yes. The Transfiguration is a “Theophany,” an event that reveals God as Trinity. Wow. Thank you, Father. The more I read, the more I understand how very little I know. Geri Priscilla – Thank you for sharing your joy! Thank you again, Father. I know nothing about Hebrew and was unaware of the term Basra. Very interesting. And thanks for the reference. I’ll definitely get it and check it out. Seems like just the kind of stuff I’ve been looking for! I think my focus has been too wide in trying to coalesce the significance of water in Scripture with the blessing of the waters and the Baptism of Jesus. The point you make about Genesis 1:2 as an “echo” of creation stories in ancient cultures is a good point and it is something that I did not consider. As I now understand it, the primary reason for Israel (and every culture) to hear the words of Genesis 1:2 is that it points to Israel’s God as the one true God, Creator of all things ex-nihilo, as opposed to the pagan creator gods who are themselves the waters, the sun, the moon, etc. Your explanation of the destruction of the demons of “the deep” and the defeat of the “watery chaos” by Christ’s decent into Hades, citing the Baptismal Psalms, Isaiah, and Ezekiel helps a great deal as well. I have a tendency to veer off track and misconstrue the meaning of blessed waters, fighting the thought of them as having an inherent power in and of themselves (a pagan thought indeed!). So, thank you Father! Very helpful! How freeing it was for me to see the material world in a positive light in Orthodoxy. Every sacrament we have involves the material in some aspect, water, oil, wine. bread, etc. Of course the Holy Spirit infuses them with His life giving energies/grace. How wondrous our salvation! God become man, redeeming flesh with His own flesh, redeeming all we are, the whole person. Was it Geri above who wrote of how joyful are our feasts? Oh yes! Just a little more. All of our being is also involved in worship. We do not sit passively in a sterile gym-type auditorium. Beauty surrounds us as it will in heaven. In my mind, some elements of worship seen in other religions, that are similar to Judeo-Christian worship, are because of God’s relationship with mankind from the beginning. I see the Holy Trinity as the Source, the first. All other beliefs come from that source as an aberration. As people spread out they all had a piece of the original Truth of the One God that morphed. I do not know if the Tower of Babel is taken as a literal event or not in Orthodoxy, but that would a point of dispersal that could lead to the falling away of the full knowledge. Their practices morphed into worshipping the creation instead of the creator, or gods that had human character, etc. The Yazidis for instance, who have a piece of the story, but believe that God created, then left his creation to the care of the peacock angel. Some religions hold some of the same values of the One God. It always flabbergasts me when groups claim that Judeo-Christian belief took all the stories from elsewhere. I saw a guy in a store who had a shirt on saying something like, “Silly Christians, Pagans were first.” and then an exhaustive list of points. While the Faith did take on the name of Christ later, the faith in the One God existed first. It is all very fascinating. When reading about Orthodoxy coming to Alaska, thankfully, the monks got to know the indigenous peoples first as people they became friends with and loved. When the locals asked the monks about their beliefs they affirmed the things they believed that Orthodox did too, then explained what they believed. All truth is Orthodox truth. And then when those peoples came to believe in the One God, it was a fulfillment belief. A wonderful approach indeed. All I can say is AMEN, AMEN, AMEN to that. 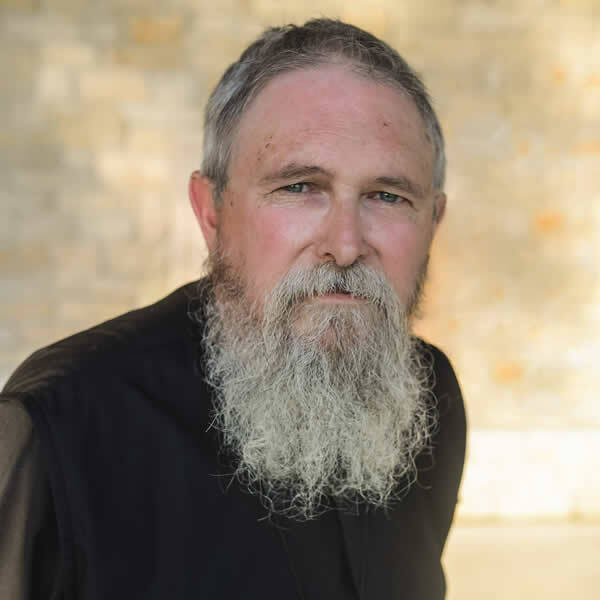 Although I do not have the mileage that you do in Orthodoxy, so far my experience of Orthodoxy and Her sacramental life…if not most of the time only just an awareness of it, is like seeing the dawn of a brand new day. You can remember, as you alluded to, when you did not comprehend the world/creation as sacrament nor even know what that meant. I am in it’s beginnings (coming to the faith late in life) and do not have the mileage, but am convinced that it is the very thread of Life … Christ’s ultimate gift to us and all creation. I am the midst of unlearning, adjusting, and now relearning the truths of the Faith, there are times (many!) when I know I am “missing something”! What I am most concerned about though is ignorance in not knowing what I am missing!! The “missing something” is what I was referring to in trying to comprehend the blessing of the waters, etc. I have a terrible habit of thinking in concrete terms…and it takes a while for these “non-western” concepts to “gel”, but once I get it, I “get it”….and I have to believe I’m getting there! Your words are encouraging Dean and give me incentive to never despair! Thanks! Thank you too (two) for your kind words. There is so much in Orthodoxy of which I also am ignorant. For myself the focus in my life has to be prayer…I know this and pray too little. If we are truly seeking, hungering, then God leads us forward at His pace and timing. I’ll die spiritually ignorant of so very much. ..now in my 70’s. However, if we do really thirst after Christ then we can be certain that His leading in our life is perfect, though we often fail. I constantly take refuge in the refrain, “Lover of mankind”…of course here with all our sisters in the faith. Ignorance is not bliss but Christ and His Church, the Panagia and all the saints are. Regarding the question of the compatibility of the Genesis accounts and modern science of origins, have you ever read or listened to any of Hugh Ross’s work (Evangelical founder of the organization, Reasons to Believe)? 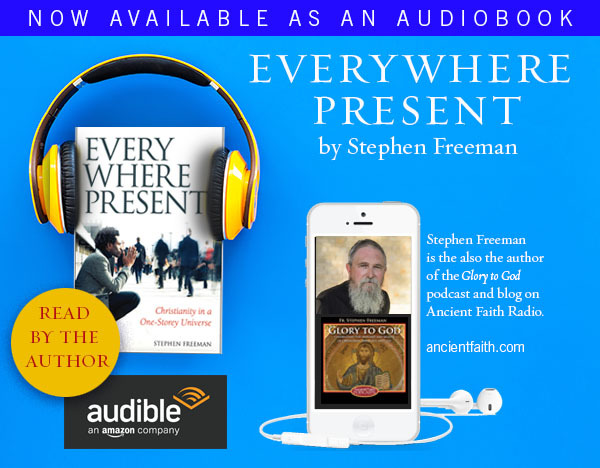 He has a very interesting testimony and shows how what we actually know from science keeps validating the biblical creation accounts and anthropology and throwing evolutionary theory about human origins into chaos. He is an old earth creationist and became one (and also a believer) through his study of astrophysics. He has quite a few talks and debates (with atheists and young earth creationists) posted on YouTube. Probably all also at his website. I haven’t read Dr Ross’s work, rather, I just did a quick Wikipedia search. The entry in Wikipedia leads me to think that he is not antagonistic to evolutionary theory, but proposes that evolution and abiogenesis is ‘guided’ by God. Beyond that, his approach to reading/studying the Bible doesn’t seem to resemble an Orthodox approach to me, which is a conclusion I arrived at by only briefly reading some introductory material on his website. This doesn’t mean to me that there might not be merit in his work, or some points that might be helpful, it’s just that when he builds corollaries between the Bible and science, I wonder whether such relationships he draws might not be helpful for living in Christ as is taught in the Orthodox Tradition. For example, does he mention anything about mystery, in the ‘natural’ world or in science? I am curious to hear what Father Stephen says, also. But I’m not sure this is on track with this article, unless he (Fr Stephen) wants to address chaos theory. And it is interesting that there are patterns seen even in ‘chaotic’ systems, that can be seen as quite beautiful. But again, I don’t think this is the same ‘chaos’ Father Stephen is writing about. But I’m here to learn. Karen, rather than drag this thread into evolution, look at the root of the word chaos. It can be a way of describing the nothing before the Word brought this into existence. Long ago Johnny Carson had a cosmologist on his program who had been a Jesuit priest. The cosmologist looked a bit monkish. Way beyond Johnny but quiet memorable to me. The man, talking about the beginning, questioned the singularity hypothesis of the Big Bang, he said that before there was stuff, there was the undivided and the infinite–God. “Without form and void…” is difficult for my poor imagination to comprehend. How can I understand nothing? No thing. Thinking of chaos as disorder still posits “things” and how they interrelate does it not? Even math requires things. Numbers and differentiation are about ordering things even the highest levels of math. Every origin story I have read or read about assumes some level of thingness at the beginning. Even Genesis can be read that way. The different types of evolution, all of them that I am aware of, have similar assumptions. However, Traditional Christianity teaches creation Ex Nihilo. If God created things out of nothing there was instant separation as some Fathers teach. However He intends for the separated to become unified with Him while still retaining their thingness. That seems to require a Transfiguration of things not growth or adaptation. That is an entirely different paradigm and telos than evolution of any type considers. So different as to make evolution irrelevant IMO. All evolution is about progress or dissolution not Transfiguration. As Father Stephen says God did not come to make bad men good but dead men alive. One does not evolve from death into life. Lazurus did not evolve from his tomb where all thought he lay inert and stinking. He was brought forth. God Himself ressurected, by His own will. Oops! I see I created confusion by employing the word chaos(which Dr. Ross employed in a completely different context). The chaos Dr. Ross mentioned has nothing to do with that in this post. My question was not at all to challenge anything Fr. Stephen was saying, but was strictly tangential. Just as Fr. Stephen has a particular burden to reach those who turn away from Christ because of overly literalist and legalistic or moralistic interpretations of Christian faith, Dr. Ross has a burden to reach those who believe (because of young earth creationism) that sound scientific discovery cannot be reconciled with faith in the biblical God. His testimony was quite interesting and inspiring to me and even seems to parallel in some respects Dee’s I believe. Yes, in that his faith is Evangelical it will lack the depth of Orthodoxy, but as approaches to the biblical record and the discoveries of modern science go, I found him to be very respectful of both, well informed in the latter, and deliberately irenic and instructional in his approach, not polemical as is so much around this topic out there. I was favorably impressed, so just wondered if Fr. Stephen had any exposure. That’s all. Indeed, I would prefer that we not get drawn into the evolution debate. Genesis can (and should) be seen from a number of angles. The text, in its original context, would not have intended a creation ex nihilo. It is, instead, a theological correction of the Mesopotamian cultural consensus, that rightly asserts the Lordship of God over all things. But in the reading of the Fathers, Michael is right, “without form and void” is treated as nothingness. In an odd way, “nothing” is the ultimate chaos. I think of this in the other direction sometimes. The “nothing” that threatens me now (with its chaos), is the nothing of non-being, meaninglessness, etc. This is sin and death. It is not a “state” of things that threatens us, but a direction and movement. To move towards non-being is the very rejection of the gift of God and the very heart of sin. Truly all things are vanity. Life is but a shadow and a dream. For in vain does everyone born on earth trouble himself, as the Scriptures say. When we have gained the world, we take up our abode in the grave, where kings and beggars lie down together. St. Athanasius grounds the doctrine of the Incarnation and our salvation on the creation ex nihilo. It is why, I think, it is always correct for theology to be “ontological” in character. Being and Non-Being are primary categories for Orthodox thought. I think that it is there, on the question of being and non-being, that we can have a fruitful conversation with science. It is more metaphysics than physics. But as my old physics professor used to say (he was an Oak Ridge scientist), “The further you go in physics, the more theological the questions become.” Our conversation with science becomes extremely unfruitful when we begin to discuss mechanics. Whatever “mechanical” involvement God has with creation, it is hidden. He sustains us in our being at every moment – but this fact remains hidden unless it is sought. One thing we must remember is that the pagan doctrine of chaos posits the eternal existence of matter and that even the gods are made from this chaos. This is diametrically opposed to the Judaeo-Christian view of creation. The very first sentence of Genesis is the demarcation line between pagan creation myths and the Creation story of Genesis. In our world view God, who is pure spirit and not matter at all, created all things in Heaven and on Earth. Our understanding is that this creation is out of nothing, ex nihilo. The void and lack of form in our view is after the beginning of creation and not before. To really grasp the total separation between our beliefs and all the pagan myths I recommend “The Bible among the Myths” by Dr John N. Oswalt. It is a text written out of his class notes (a class I took from him in Seminary) and if you can wade through the technical philosophic reasoning, he clearly demonstrates that our beliefs are not only different than paganism but they came out of no worldly source and quite suddenly. Revelation can be the only answer to how this happened. It happened in encounter with the Living God and it set the Hebrews apart from the world. As one learns about the differences in concepts and thought patterns of pagan beliefs and the Judaeo-Christian world view it becomes readily apparent that paganism only slightly resembles our beliefs and the similarities are not based on common belief, but are accidental in nature. We have a flood story as do they but when one examines the details they are totally different in concept. In most such pagan myths the events take place outside space and time whereas in Genesis, the flood takes place on Earth in time. To be fair, you will hear things from TV preachers that masquerade as Christian ideas but they are utterly pagan. Paganism has Sympathetic Magic as a fundamental principle. The purpose of pagan worship and religious acts is to control and influence the gods. This is based on the Principle of Continuity (which is activated by Sympathetic Magic) in which our actions on Earth have effects in the heavens. We can force the gods to do our will by implementing an action that puts pressure on them. If that does not work we can appeal to the Meta Divine which is power that is above the gods and has influence over Chaos. You will hear this preached as one of the Seven Spiritual Laws that even God must obey. It is called in TV land the Law of Sowing and Reaping. This is utterly pagan thought and not Christian at all. Remember also that the Psalmist says “all the gods of the Nations are demons….” Because demons are liars and manipulators that tell only half truths at best, we can expect that they would deceive the pagans by only given them enough truth to sound like truth, but really tell a bald lie. Many make arguments that the Hebrews must have believed in Tiamut/Leviathan, because their names appear in Scripture. Likewise we have the idea of Christ descending into the waters to crush the heads of the dragons (demons) that live there. ) I am not so sure that Scripture is not mocking the pagan beliefs (after all “who put the hook in Leviathan’s nose?”) and Christ is demonstrating His power over demons and pagan ideas by entering into the waters and dispelling any ideas of it being Chaos. Remember the story of the demoniac in Mark Chapter 5, the demons could not even haunt pigs without His consent. This seems a continuation of the idea of cleansing of the waters. Christ is Pantakrator, Ruler of All. All things owe their existence to Him and if He forgets them, they are not. Lord, Remember me in Your Kingdom. Microchimerism: how pregnancy changes the mother’s very DNA – Katherine Rowland | Aeon Essays. Thank you Father Stephen for the interesting post! If I may, I could point to the idea of water covering the earth . To the people of the Nile Delta where inundations renew the soil yearly ( I think) and to the delta of the Tigris and Euphrates floods have been terrible events with water covering the land which people lived on. Deltas are built up by floods but are good places for agriculture Other rivers flood badly when there is runoff from mountains where there has been heavy snow. Tribes which relied on grazing sheep/goats cattle would be equally affected by extensive flooding and the destruction of pasture. So I think waters covering the earth from horizon to horizon would be a good description for a memorable flood and be talked about for years. I hesitated to respond to your above post because I simply did not know how to express my thoughts concisely. I am going to attempt to do so now, so please bear with me. First, I agree with your wonder about God’s universe and the discovery of Black Holes. It is no surprise that they are a mystery. I can understand how you see our role comparatively small when considering in quantity the organic life of the entire universe. However, when I consider, not quantity, but quality , I see what Christ has done for mankind in His incarnation, death and resurrection for us to be the Church, Heaven on Earth. We are His Body, His witness, and this is no small role. So there are two sides of the equation…the One and the Many. And the very concept of suffering and death (looking into the Black Hole?) is misunderstood by the world, for it is by that very means we enter into Life. So as you say, “suffer we must”…yes indeed, if one is to experience True Life. What they define as paradox, we as Christians know as the giving of oneself, even to death for the sake of Life (is this not what mothers do? )….as Christ has done for the life of the world. I don’t want to further pick apart this article…my response is already lengthy enough. I will say though, I get the distinct impression of a secular, strictly biological worldview in their theory and therefore in their conclusions. I do not detect a value of life as God has given us, even in the miracle of birth. The “inconveniences” are chalked up to “microchimerism” rather than the giving of oneself for the sake of the other. What a very strange word! The very chaos that is present in this world is the philosophy of secularism/modernism. But Christ, Glory to God, has given us victory! In several icons of Theophany that I’ve seen, there are two sea creatures lurking in the waters near the feet of Christ. Are these suppose to depict the Leviathan, Tiamat, or other monsters of the water?